These Unseen Pictures from Sonam Kapoor's Wedding will Literally Melt Your Heart! Whoever said that “fairytales don't come true,” didn’t witness the love story of this #EverydayPhenomenal couple - Sonam Kapoor and Anand Ahuja. While Sonam is one of the most fashion forward actresses of Bollywood, Anand is an entrepreneur who managed to sweep the diva off her feet, and how! While their wedding not only broke the internet (literally), it also gave all the brides-to-be out there some major #BridalInspo. 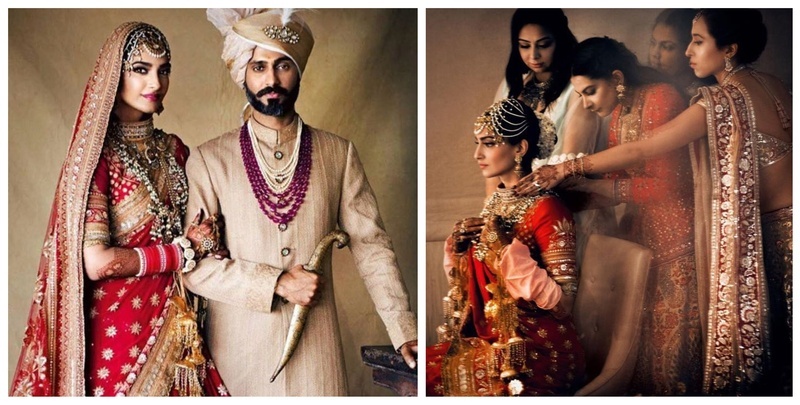 Their wedding was documented by none-other than Vogue India, and the pictures are def breathtaking. Starting with the intimate mehendi function held at her house. Doesn't she look like a princess? Lotus is her favourite flower and her mehendi is proof of that! ….and she is ready to slay! There’s never a wedding without your squad and #SonamKiShaadi saw the bride with her pillars of strength! Her headgear is totally one-of-a-kind! She said in an interview it’s a heritage piece she’s created for the generations to come and I think it’s stunning! Words fall short to describe the love and beauty of a father-daughter bond and this candid capture of Anil Kapoor and Sonam has left us short of words. This image of an overwhelmed bride literally pulled our heartstrings. The B-town’s fashionista basking in her own glory! The superwoman moment in an offbeat Anamika Khanna lehenga! The smiles that make ‘Everyday Phenomenal’ really phenomenal. Sonam opened up about her love story with Anand Ahuja in a recent interview and these 2 are definitely coupe goals! There's nothing we don't love about these lovebirds. While the duo are currently in London building their new home, these throwback pictures have definitely made our day!